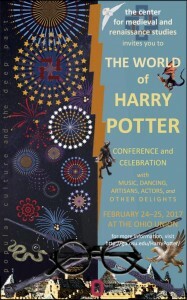 On February 24-25, I was privileged to participate in The Ohio State University’s Popular Culture and the Deep Past 2017 conference, hosted by the Center for Medieval and Renaissance Studies. This year’s focus was “The World of Harry Potter,” and though it was a local conference for me, it brought together a far-flung set of Potter scholars, as well as thoughtful fans (some in period attire!) with engaging questions and contributions to the conference. 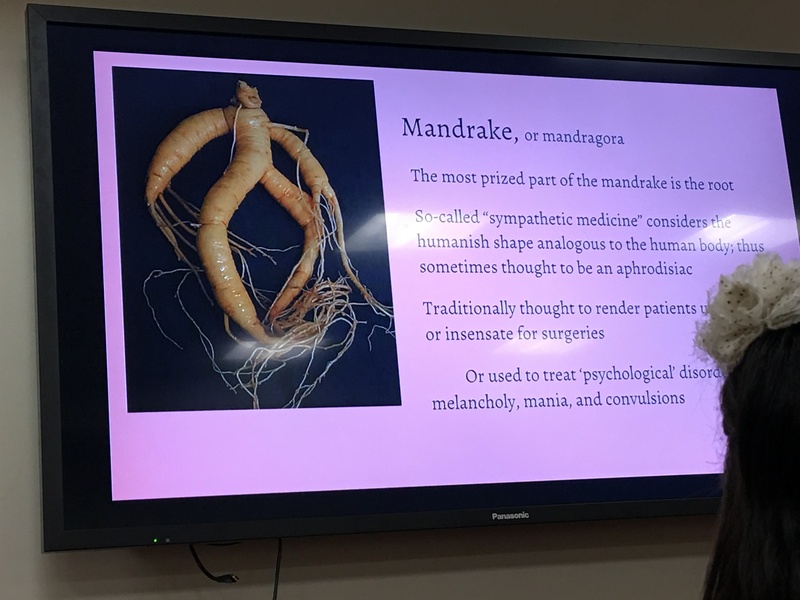 On Friday, OSU undergraduate students put their current studies to work, tackling topics such as the medieval quality of feasts in Potter and parallels between Dumbledore and Merlin. The afternoon was capped off by keynote speaker John B. Friedman’s excellent tour of the classical myths and medieval beasts Rowling employs in her tale. On Saturday, Alexandra Garner from the University of Oregon shared her analysis of wands in Potter as classic medieval weapons, mentioning the motif of the broken weapon as a symbol of a flaw the hero must overcome (Ron, Neville and Harry all must deal with broken wands throughout the course of the saga). Li Parrent from New York University pointed out Rowling’s use of medieval demonic descriptors in her depiction of Voldemort: handsomeness (before his fall), pale skin, red eyes and the ability to bodily transport oneself (eg. flying; something he teaches to Snape, which seems to point up the depth of poor Snape’s commitment to his double-agency: a commitment which in Parrent’s analysis has a spiritually defiling quality about it). 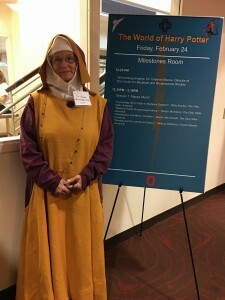 Bethany Christiansen gave a fascinating talk on medieval botanical lore and Rowling’s heavy borrowing thereof. 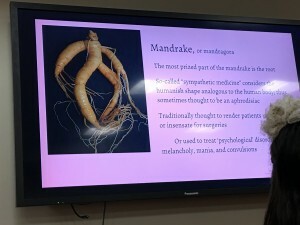 She shared images of many medieval plants mentioned in Potter, including mandrake roots, making clear the origin of the myths surrounding them (they look ready to jump out of the soil and run away!). Elizabeth Cook, all the way from the U. of Birmingham in England, made brilliant connections between forests in Potter and Shakespeare’s “Green World”: rural, wild spaces in his works that function for his characters as places of retreat, revelry and mystery. These “Green Worlds” in Shakespeare are also spaces of regeneration and restoration, which makes the Forest of Dean the right setting for the Trio to receive the sword after their Godric’s Hollow fiasco, and the Forbidden Forest the obvious spot for Harry’s own death-and-resurrection in Deathly Hallows. Then Zachary Melton who came to the conference from the U. of Iceland (!!) spoke about James Potter as an archetype of a kind of “pagan past” (if Lily’s sacrifice can be seen as a baptismal moment) who inspires both heroism but also fault in Harry – a motif found in medieval Icelandic sagas. By far my favorite talk of the conference departed from the medievalism within the Potter saga, but was so absorbing that no one seemed to mind. OSU-Lima professor of English, Beth Sutton-Ramspeck gave the talk, entitled, “Filth! Scum! By-products of Dirt and Vileness! : The Dirt on Dirt in the Harry Potter Series.” At first suspicious that we may have stretched Potter studies too thin if we’re analyzing something as insignificant-seeming as dirt, I was proven wrong with every point Sutton-Ramspeck made. Thanks to her careful analysis, dirt becomes an intriguing and effective characterization and evaluative tool in Rowling’s story, but in an ironic and surprising way. Privet Drive (bad) is described as “tidy” twice in the first two chapters of Philosopher’s Stone, and yet Harry (good) is introduced to readers as having “untidy” hair. Aunt Petunia (bad) is forever scouring her countertops, and yet The Burrow (good) is first described as looking as if it had once been a “large, stone pigpen.” Sutton-Ramspeck went on to analyze the “filth” descriptors used by Death-Eaters (VERY bad) against “Mud-bloods” to promote their pure-blood agenda, pointing up Rowling’s fascination with eugenics in this series – a fascination that continues in Fantastic Beasts. 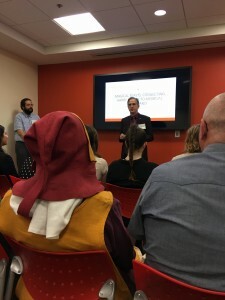 Many thanks especially to Graeme Boone of the Center for Medieval and Renaissance Studies, who surely exhausted himself in pulling off such a rich offering of scholarship in such an engaging atmosphere. 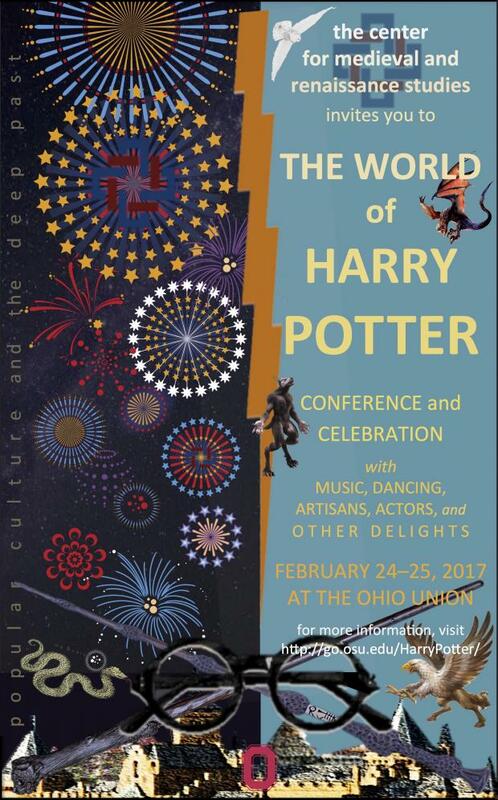 And I would be remiss if I didn’t share my own contribution to OSU’s Popular Culture and the Deep Past 2017: The World of Harry Potter. 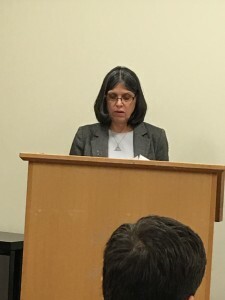 Next week I will post the full video of my talk arguing that Rowling’s heavy reliance on elements of the Christian sacramental principle to undergird the magical framework of her seven-book series is indeed a particularly medieval expression of that same principle. Stay tuned! Until then, I invite you to follow me on Facebook and Twitter (@ekcstrand). It would be really interesting to go to something like this someday!! i’m interested in both your talk and the one on wands/broken weapons by Alexandra Garner. is there a print copy available? Kelly – what’s stopping you??? Would love to see you! Thanks for reading. Wayne – I plan to post a video of my talk here next week – thank you for your interest. I’ll inquire with Alex Garner about getting you a copy of hers. It was well done. Thanks for the comment. That’s all I know. My talk, as I teased above, is on YouTube now (Emily Strand, “HP and the Sacramental Principle”) and I’ll put it up at HogPro at the end of this week. Thanks again for your interest! I also appreciated the question over Squibb’s. Most of us had a chuckle over Filch getting started on the clean up after the Battle of Hogwarts, yet another grand film moment, but since dark magic cannot be undone magically, it was the work most would have to muck into at some point. (Did the Slytherins?) Like Filch’s start, Harry’s digging, and the Hufflepuff unafraid of toil, simple work and/or rebuilding/restoring/refurbishing can also demonstrate a redemptive quality. it has been observed that we don’t admire those who achieve because they overcame an obstacle but because they achieved despite them. In most cases, the impediment didn’t “magically” go away, but remained present to go around, over, through, or made part of the project.